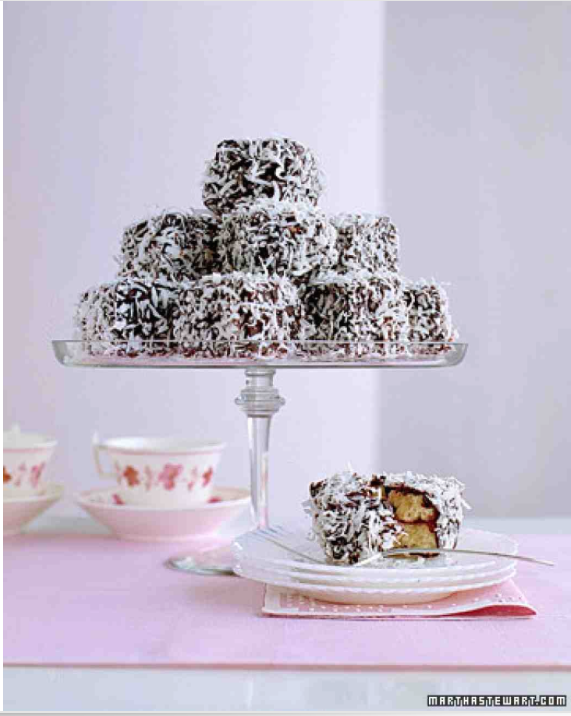 Lamingtons Cake...I think I hate you. Two years ago I walked in my parents house and sitting on the counter were two slices of cake. Slices is not the right word. They were cubes. This was not your normal cake either. These two pieces were completely frosted, I mean all sides chocolate, and then covered in coconut flakes. When cake is left on the counter like this, it is usually for my nephew. I didn't care though, I shifted my eyes in both directions, making sure that I was not going to get caught, and then I took a bite. All of a sudden memories of a similar tasting cake flooded my brain and I recall having this cake when I was a kid in India. Though useless to try to pretend I didn't get to the cake first though, considering all sides were covered in chocolate and one is clearly not anymore, I still took a knife out of the drawer, cut off the side I ate and then went on my merry way. I later found out that this cake is called Lamingtons Cake and it was true, we used to eat this type of cake when we lived in India. My mom had been at a party and snagged a few pieces for my nephew. He decided that it was his favorite cake. Ever. My parents buy it from a local lady at that their church who sells the cake at $2 a piece. Seemed a little steep..until I tried to make these little guys. These cakes are Australian in origin and are made up of a yellow spongeish cake. They are drenched in chocolate, and then rolled around in coconut shavings. The idea doesn't seem too complicated. I would consider myself a baker. I've even made a few wedding cakes in my time. I can handle this. So when my nephew turned 13, I made the decision to take on the task of the cake myself. I turned to my friend Martha for some inspiration and guidance. You may know her as Martha Stewart. Of course she had a recipe for Lamingtons Cake. The actual cake was pretty tasty. It was the chocolate and coconut that did me in. I was in the middle of melting the chocolate over the double boiler when I realized I ran out of powdered sugar while making it. c) how messy this part is. Despite my better judgement, I chose a few that didn't look terrible and presented them to mom. I told her, not to tell anyone that I made them. I need to see their opinion first. It was a unanimous thumbs down. The chocolate icing was so grainy, you could taste the sugar granules, apparently making "close enough" powdered sugar is not the same thing as powdered sugar and the coconut topping was too big and not evenly spread over the cake. The cake was a disaster. Luckily, my mom and my husband were the only ones that knew it was me that made the cake. Well there was one other person that knew. I knew. And this cake is going to haunt me until I can make a redo. You have not seen the last of me Lamingtons. I will be back.